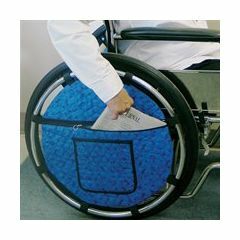 AllegroMedical.com presents The Wheelchair Wheel Pouch. Large outer pouch carries reading materials, clothing articles and personal items. Inner pouch secures cell phones, remotes and valuables in any of the three secure pouches. Quilted, machine washable fabric attaches to most any wheelchair with secure hook and loop fasteners. everybody is asking for it!!! ng out,. have to turn the wheel. you have to turn the wheel, sometimes, to get to the right pouch. Has anyone used this product? Is it easy to get keys, phone , in and out of pouch, and are they safe as the wheel turns?